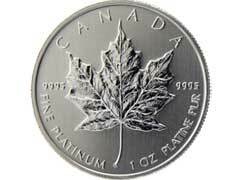 The platinum maple leaf coin from Canada was popular in the 1990s when platinum coins were highly available. When platinum rose in price, investors became less interested in coins made from platinum and it is now difficult to find platinum bullion coins in general circulation. At this time the platinum maple leaf bullion coin can be ordered directly from the Royal Canadian Mint and these coins do come in vinyl sleeves. When graded at .9995 purity these coins are legal tender and reflect their platinum content rather than the face value. The platinum pricing is based on the spot price plus a premium per coin. Current premium pricing of platinum is reported every day in online and television reports. According to Kitco, today’s price for spot platinum per ounce is $1400. The minimum purchase for a sleeve of platinum coins is five ounces and the face value of the coins is $50.00. In comparison to the platinum maple leaf, Canadian maple leaf gold coins are high in trading value and are some of the most desirable bullion coins available. The gold maple leaf coin is .9999 purity and is used as legal tender. Today’s gold spot per ounce price is $1,577.68 and the price does fluctuate daily. As of the current market trends the maple leaf gold coin is outselling the South African rand by a high margin. Traders and collectors recognize that the gold content in the Canadian coins is extremely fine and the .9999 purity rating is certified. Canadian silver maple leaf coins contain a silver purity of .9999 certified by the Royal Canadian Mint and these coins are the highest purity silver coins made by a government mint. To purchase these silver coins you must purchase 75 ounces of the precious metal and these prices are reflected in the daily market price of $27.77 an ounce. Most silver Canadian maple leaf coins are minted in $10, $20, and $50 face value. The price of the coins, however, is reflected by the silver content rather than the face value. All maple leaf coins are minted with the recognized symbol of Canada or one maple leaf. The reverse side of the coins reflects a figure of Queen Elizabeth II. Canadian platinum maple leaf coins as well as silver and gold maple leaf coins are highly collectable because of their beauty and their extraordinary purity and high quality. Platinum coins will be a wonderful additional to any collection of pure metal coins.